Mars is actually the most-studied planet in the solar system after Earth. In the last two decades alone, it has been under constant observation and study, yet we know very little about the Red Planet’s interior. 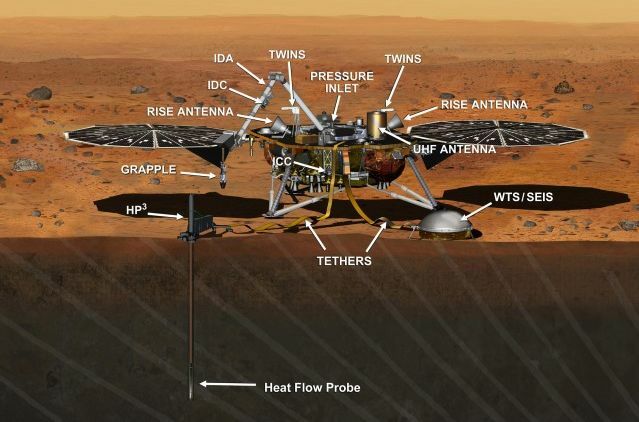 That should change from Monday, November 26th, 2018, when NASA’s latest mission to Mars, the Interior Exploration using Seismic Investigations, Geodesy and Heat Transport (InSight) lander touches down on Elysium Planitia. The aim of the mission is to carry out a detailed examination of the Red Planet’s interior – its crust, mantle and core. Doing so can answer key questions about the early formation of the rocky planets in our inner solar system – Mercury, Venus, Earth, and Mars – more than 4 billion years ago. In addition, the data gathered may also help us to understand how rocky exoplanets orbiting other stars in our galaxy may have formed. I’ve covered some of the more unique aspects of the mission in previous Space Sunday articles (see Insight on InSight, May 2018 and Mars Roundup, October 29th), including the use of two unique surface instruments, the Seismic Experiment for Interior Structure (SEIS) and HP3, the Heat Flow and Physical Properties Package to probe the planet’s interior. 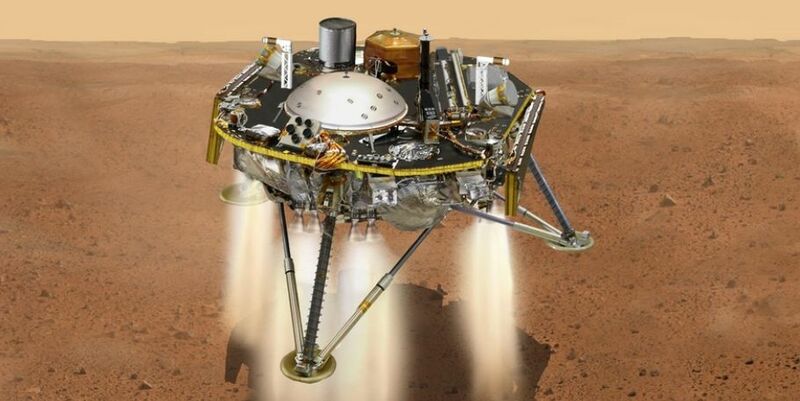 However, in order for the lander to use these, and its other instruments, it must conclude its 6-month journey to Mars with the Entry, Descent and Lander (EDL) phase – or as NASA mission engineers are calling it, 7 minutes of terror. 19:47 GMT: encased in its aeroshell, InSight will enter the upper reaches of Mars’ discernible atmosphere 114 km (77 mi) above the surface of planet at 19,800 km/h (12,300 mph) at a critical 12-degree angle of attack. Any less than this, and it could bounce back into space, any greater and the heat generated by atmospheric entry could overwhelm the heat protection (designed to withstand temperature up to 1,500oC / 2,700oF, which is reached 2 minutes into the entry sequence), and burn-up the lander. 19:51 GMT: having been slowed to 1,400 km/h (860 mph) and at an altitude of 11 km (7 mi), the primary parachute is deployed. 15 seconds after this, the lower heat shield is jettisoned, and 10 second after that, the three landing legs are deployed. 19:52 GMT: ground sensing radar activates to measure the distance to the ground. 19:53:25 GMT: the lander separates from it aeroshell and parachute and the landing motors start firing as the lander orients itself for touchdown. 19:53:47 GMT: the motors reduce velocity from 27 km/h to 8 km/h (17 mph to 5 mph). 19:54 GMT: InSight touches down, with the motors immediately shutting down to avoid “bouncing” or toppling. Depending on how systems check-out, the first image from InSight could be received by mission control about 8-10 minutes after landing – although equally, it could be received any time in the first 24 hours after landing. The Mars Odyssey orbiter should overfly the landing area at around 01:30 GMT on November 27th, and will hopefully be able to image InSight on the surface of Mars with its large, circular solar panels fully deployed – these will initially remain in their stowed configuration for around 20 minutes following landing to allow the dust thrown up by the lander’s motors to disperse and settle so that it doesn’t interfere with their operation. Once settled on Mars, the primary mission, designed to run for a full Martian year, will commence – although it will be one that could take time to unfold. InSight is kind of a laid-back, slow-motion mission. It’s going to take us probably two to three months, at least, to get our instruments down, and it could be early next spring before our principal instruments started returning data. As well as direct transmissions during EDL, NASA hopes to get real-time telemetry of the landing from a pair of cubesats, called Mars Cube One (MarCO), that launched as secondary payloads with InSight in May, and which will fly past Mars during the landing. For those who wish to follow it, the InSight landing will be broadcast on a number of NASA on-line resources available. 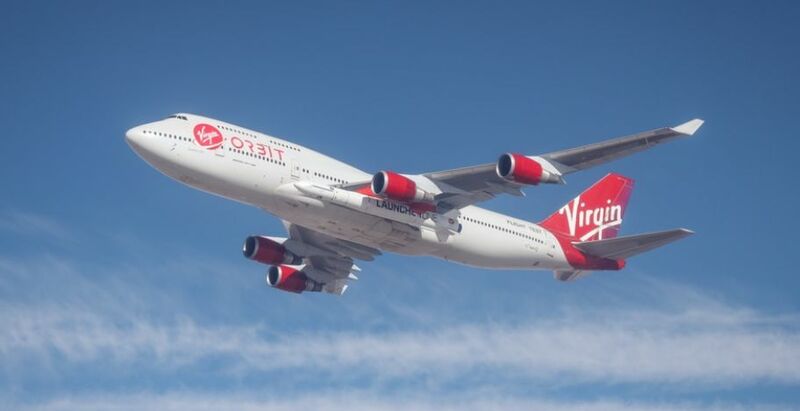 On November 19th, 2018, Virgin Orbit, the commercial launcher company founded by Sir Richard Branson’s Virgin Group, achieved a major milestone on the road to commencing operations, with the completion of the first captive carry test. Carrying an unfuelled LauncherOne rocket under its port wing, the company’s Cosmic Girl launch aircraft, a converted Boeing 747 200, took off from the Southern California Logistics Airport in Victorville at 11:00 am local time for an 80-minute flight over the desert regions of southern California – including the Mojave Air and Space Port, the base for Orbit’s sister company, Virgin Galactic. It was the first of several such flights designed to test the handling of the carrier plane with the rocket emplaced on its launch payload and gather data about aerodynamic performance, structural loading, and more. The flights will culminate in a drop test using a water-loaded rocket to test the launch release mechanism. If this proves successful, the first full orbital launch will take place in early 2019. Taken together, Cosmic Girl and LauncherOne are intended to provide a capability to place a 300 kg (660 lb) payload to a 500 km (310 mi) Sun-synchronous orbit, suitable for CubeSats and small payloads. Once airborne, Cosmic Girl will carry the LauncherOne to altitude out over the Pacific ocean prior to releasing it. Once clear of the carrier aircraft, the three engines of the rocket’s first stage will ignite, lifting it up through the atmosphere before separation, allowing the single-engined upper stage to carry the payload up to orbit. The first orbital flight will likely carry a dummy payload, the second flight has been chartered by NASA to carry multiple small payloads. The cost for the launch of each rocket is estimated to be some US $12 million, potential making Virgin Orbit a highly competitive entrant into the small satellite launch business, particularly where multiple payloads are concerned. 4.6 billion years ago, our Sun was born as a part of a cluster of stars. Since that time, those stars, the Sun’s siblings, have drifted apart to be distributed across the galaxy. Finding these sibling stars has been of considerable interest to astronomers because they could go a long way towards telling us more about our own Sun’s history. In addition, solar siblings might also be good candidates when it comes to the search for extra-solar planets that could support life. Now astronomers engaged in a search for such siblings – called the AMBRE Project – believe they have not only discovered one, but they may have stumbled on the Sun’s exact twin. The star in question is HD186302, located in the southern hemisphere constellation Pavo (Peacock), 184 light-years from our Sun. 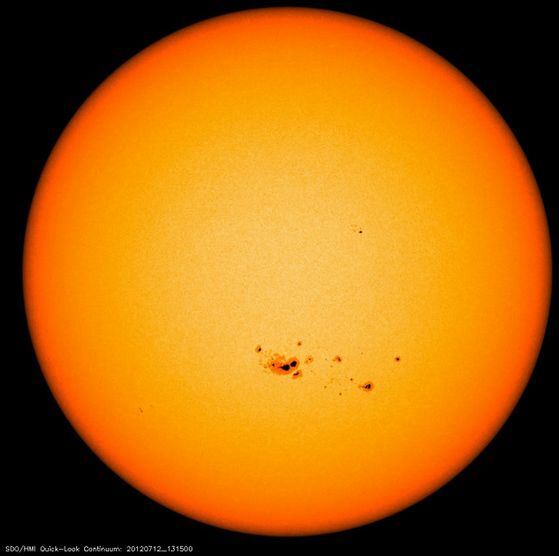 It’s long been known to be of a similar spectral class to the Sun (G2V), but the review of data gathered by a number of instruments at the European Southern Observatory (ESO) has revealed HD186302 is almost identical chemical composition and age as the Sun and is of a similar size and mass. This has led to speculation that if HD186302 is a “Sun 2.0”, it might have a planetary system orbiting it – including a possible “Earth 2.0”. However, before anything like that can be given serious consideration, astronomers need to ascertain whether or not there are any planets at all orbiting HD186302. This is something the astronomers at ESO hope to ascertain using the observatory’s HARPS and ESPRESSO instruments. NASA has confirmed the first test flight for the SpaceX Crew Dragon vehicle, intended to fly astronauts to and from the International Space Station, will take place on Monday, January 7th, 2019. Designated Demo-1, the flight will be uncrewed, and will lift-off from Launch Complex 39A at NASA’s Kennedy Space Centre. It will be the first orbital test for the vehicle, and will see it rendezvous with the ISS. If that flight is successful, it will be followed in June by a crewed test flight, called Demo-2, where NASA astronauts Bob Behnken and Doug Hurley will fly the Crew Dragon to the ISS. 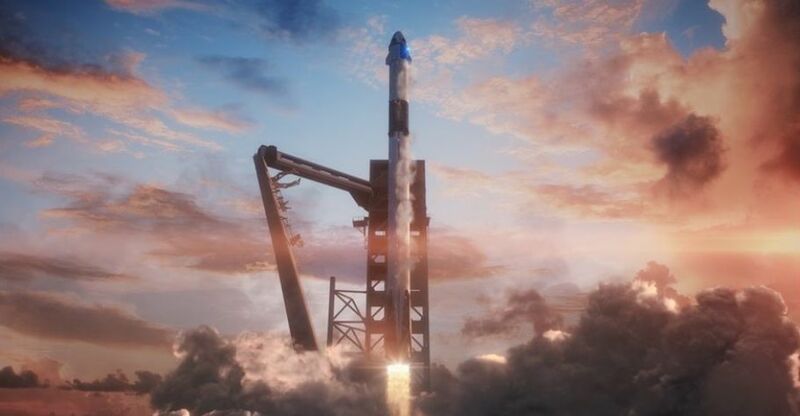 Between Demo-1 and Demo-2, SpaceX plans to perform an in-flight abort test where a Crew Dragon will use its abort system to jettison from a Falcon 9 vehicle after lift-off. Taken together, this should clear Crew Dragon for operational flights. The announcement, made on November 21st, came on the heels of another indicating NASA is to review the safety practices at Boeing and SpaceX, allegedly prompted by SpaceX founder Elon Musk admitting that he takes Zolpidem as a result of trying to run both SpaceX and Tesla. The review, which is expected to last several months, and its apparent emphasis on drug policies, took many industry observers by surprise, and SpaceX and Boeing were quick to emphasise their commitment to drug-free working environments and their commitment to crew safety aboard their vehicles. Finally, SpaceX has filed a license application with the Federal Communications Commission (FCC) to cover the testing of a “vertical take-off, vertical landing (VTVL) vehicle” that company plans to fly at its launch site under construction on the coast of the Gulf of Mexico near Brownsville, Texas. The application doesn’t name the vehicle or provide other technical details about it. However, the speculation is the license is connected to flights tests of the “scale” version of SpaceX’s “starship”, aka the upper stage of what until recently was known as the Big Falcon Rocket (the booster section of which is now simply known as Super Heavy). This “scale” vehicle was announced by Musk at the start of November. The application doesn’t mean that any test flights will commence soon: the test article has yet to be fabricated. Plus, flight tests will also require the granting of an experimental launch license by the Federal Aviation Administration’s Office of Commercial Space Transportation. However the FCC application indicated SpaceX will be making such an application. November 20th, 2018 marked the 20th anniversary of the start of the construction of the International Space Station (ISS). It was on that day, in 1998 that the Zarya control module was launched autonomously from Russia using Proton rocket. This was joined in December, 1998 by the US Unity module, launched aboard the space shuttle Endeavour, the first of three core modules. The first crewed mission to the ISS lifted-off on July 12th, 2000, marking the start of a permanent human presence in low-Earth orbit. 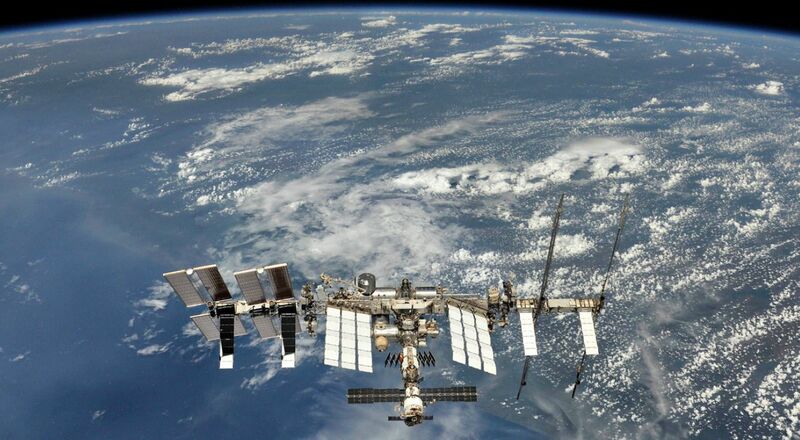 Construction of the ISS officially lasted 13 years, and the programme has involved 14 nations in addition to the US and Russia: Belgium, Brazil, Canada, Denmark, France, Germany, Italy, Japan, the Netherlands, Norway, Spain, Sweden, Switzerland and the UK. In all, 230 people from 18 nations have visited the ISS since the arrival of the first crew. By 2010, the estimated cost of the ISS was placed at US $100 billion, including the cost of all associated construction launches via Russian booster or US space shuttle. By 2015, the overall cost was said to be US $150 billion, equating to US $7.5 million per day for each person who has stayed aboard the station. There are many arguments both for and against the ISS and for its potential place in the near-term human exploration of our solar system. However, what cannot be denied is that the ISS is the most remarkable feat of human engineering yet seen, one that deserves celebration as it reaches 20 years of age and continues to circle the Earth at 7.66 km/s (4.8 miles per second), the third brightest object in the night sky after the moon and Venus.